Bhaji Vada is a common snack in northern India but every family makes it a little different. 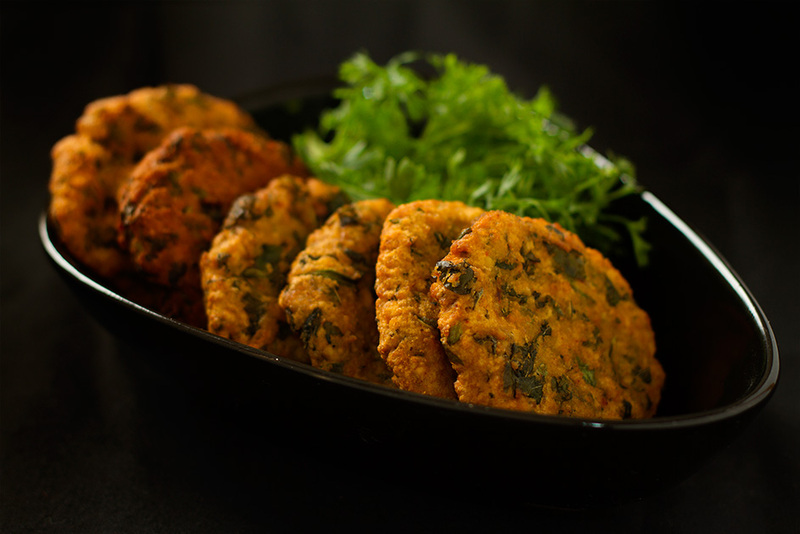 Made from Chana dal and chaulai bhaji it is extremely tasty, and quick snack. Though this dish tastes best with chauliai bhaji, you can substitute the greens with any green of your choice or make with coriander if you have no other greens readily available. Amaranth species are cultivated and consumed as a leaf vegetable in many parts of the world. There are four species of Amaranthus documented as cultivated vegetables in eastern Asia: Amaranthus cruentus, Amaranthus blitum, Amaranthus dubius, and Amaranthus tricolor. In Indonesia and Malaysia, leaf amaranth is called bayam. In the Philippines, the Ilocano word for the plant is “kalunay”; the Tagalog word for the plant is kilitis or “kulitis”. In the state of Uttar Pradesh and Bihar in India, it is called Chaulai and is a popular green leafy vegetable (referred to in the class of vegetable preparations called saag). It is called Chua in Kumaun area of Uttarakhand, where it is a popular red-green vegetable. In Karnataka state in India, it is called Harive (ಹರಿವೆ). It is used to prepare curries like Hulee, palya, Majjigay-hulee and so on. In the state of Kerala, it is called ‘Cheera’ and is consumed by stir-frying the leaves with spices and red chillies to make ‘Cheera Thoran’. In Tamil Nadu State, it is called முளைக்கீரை and is regularly consumed as a favourite dish, where the greens are steamed, and mashed, with light seasoning of salt, red chillis and cumin. It is called keerai masial (கீரை மசியல்). In Andhra Pradesh this leaf is added in preparation of a popular dal called thotakura pappu తొట కూర పప్పు (Telugu). In Maharashtra, it is called “Shravani Maath” (literally माठ grown in month of Shravan) and it is available in both red and white colour. In Orissa, it is called “Khada saga”, it is used to prepare ‘Saga Bhaja’, in which the leaf is fried with chillies and onions. Wash and soak chana daal in plenty of water for about 2 hours. After it has been soaked well, grind it into a thick paste. See to it that it is NOT ground very fine. Some grains of dal in the paste give it a good texture. Mix the leaves, ground daal, ginger, green chillies, asafoetida, salt together. Heat oil on medium flame and shape the mixture into flat fritters using your palm. Maintain the gas at medium mark and gently drop the vada in oil. Fry and remove when golden brown. Place the fried vadas on tissue paper to absorb the excess oil. If experienced, you can fry more than one vada at a time, if not, doing it one at a time would be best. Serve these delicious bhaji vadas hot.